Manufacture Roger Dubuis will be unveiling its Excalibur Star of Infinity – a model every bit as generous and dazzling as its name implies, at Watches&Wonders 2015. Like several of this year’s releases, this latest jewellery timepiece reflects the Astral Skeleton principle. 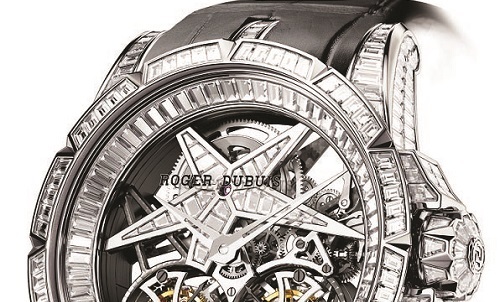 The concept is based on the unique star-shaped design of Roger Dubuis contemporary skeleton movements, borrowed from nature and its heavenly constellations. In the Excalibur Star of Infinity, formal aesthetics meets functionality, since the tips of the RD01SQ skeleton double flying tourbillon ‘star’ point to several hour-markers and thus enhance clarity. Even more significantly, they appear to stretch out towards the vast expanses of space… the infinity evoked in its name.